Malaria cases in KwaZulu-Natal, once the country's worst-affected province, have dropped by nearly 99% since the reintroduction of residual indoor spraying of DDT nearly 7 years ago and, more recently, artemisinin-based combination therapy. He stressed that still more treatment modalities were required, citing the 'serious and potentially lifethreatening' side-effects of parenteral (IV) quinine used for treating complicated Plasmodium falciparum malaria. The province now carries just 475 cases (14% of the country's malaria burden), down from 27 238 cases (or 53% of national burden) in 1999. Limpopo and Mpumalanga provinces currently have 1 777 cases (54% of national burden) and 1 054 cases (32% of national burden), respectively, versus 11 228 cases (22% of the national burden) and 11 741 cases (23% of the national burden), respectively, in 1999. 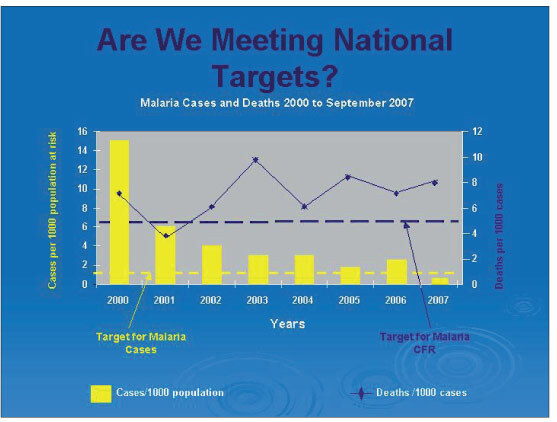 Dr Jan van den Ende, chairman of the Malaria Advisory Group to the national department of health from its inception in 1994 until May 2007, cited these figures while delivering an eponymous memorial lecture in honour of his illustrious microbiologist father, Marinus, at UCT's medical school in November last year. He said the creation of the Lubombo Strategic Development Initiative (LSDI) in northern KwaZulu-Natal, eastern Swaziland and southern Mozambique, with its 'major malaria control element', had contributed to a dramatic drop in malaria cases in Swaziland and KwaZulu-Natal. Elaborating on the shifting provincial differences, Professor Karen Barnes, a senior clinical pharmacologist at UCT, known for her groundbreaking research with regard to malaria, said malaria control was 'not as good' in the more northern parts of Mozambique where it bordered Mpumalanga and Limpopo. Mpumalanga also formed the main thoroughfare to South Africa from Mozambique. Limpopo, on the other hand, was carrying the brunt of failing malaria control in neighbouring Zimbabwe. Addressing progress in malaria control in recent years, Van den Ende said South Africa was not achieving its targets with regard to cases and case fatality rates (CFRs). Overall CFRs had hovered at 0.7 - 0.8% annually, with some provinces faring 'less well than others'. The higher provincial CFRs generally reflected the thinly distributed nature of health services and logistical problems, mostly at peripheral clinic level, such as in Limpopo. He stressed that still more treatment modalities were required, citing the 'serious and potentially life-threatening' side-effects of parenteral (IV) quinine used for treating complicated Plasmodium falciparum malaria. In other malaria-hit countries, (IV) artesunate had been shown to be much safer and about 30% more effective and efforts were underway to make this available. Van den Ende also singled out the 'unsatisfactory reliance' on quinine for treating uncomplicated infections in infancy and pregnancy. Citing research that showed rectally administered artesunate to be highly effective for treatment of malaria in infants, he said its availability should be pursued as a 'high priority'. In his tenure as chief advisor to the national health department he had seen 'an impressive development' of capacity, with each malaria province now boasting trained entomologists, allowing for ongoing studies. He added that operational and basic research was now 'soundly based'. Molecular techniques for the study of the mosquito vector and vector resistance to insecticides and of parasite resistance to antimalarials were also well established, while there was strong cross-border and international collaboration in these areas. Barnes warned in an SAMJ editorial in January 2007 that the costs of not taking advantage of the window of opportunity created by the current levels of financial, technical and political support would be 'unconscionable'. She said failing to do this would result in 'the pendulum swinging back to the disillusionment and neglect of malaria control that allowed the failure of the malaria eradication campaigns in Africa in the 1960s and 1970s'. Barnes said KwaZulu-Natal had been forced to take the DDT route because by 2000 the increase in both high-level sulfadoxine-pyrimethamine (SP) resistance in the parasite (89% treatment failure) and insecticide resistance in the mosquito vector were far greater than in other provinces (where SP cure rates were more than 90%). Of the ongoing environmental debate over the use of DDT, she said that the risks of indiscriminate agricultural use clearly outweighed the benefits. However, in malarial risk areas with no feasible alternatives, the benefits of careful indoor residual spraying (particularly ensuring no run-off) were widely accepted as outweighing the risks. Even the renowned environmental activist group Greenpeace had accepted this. 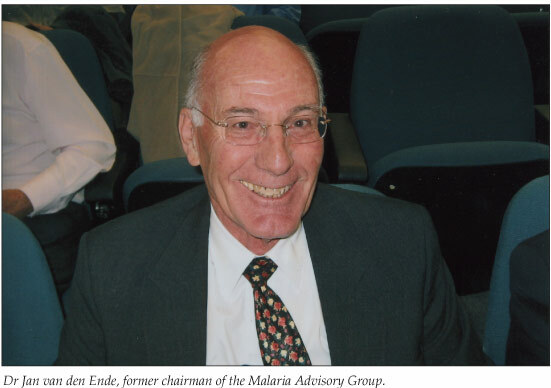 Van den Ende said his late father would have 'enjoyed seeing DDT still at work against malaria so many decades after its initial successes in combating epidemic typhus' (which his father famously initiated with dramatic success during World War II). Both malaria experts noted the phenomenon of householder resistance to indoor DDT spraying because it activated bed bugs and marked painted walls. Barnes said fascinating research showed that communities tolerated the nuisance of bed bugs and wall marking when the malaria risk was high and the socioeconomic status low. However, it was becoming increasingly harder to achieve desired indoor residual spraying coverage rates because more and more households were built in a western style with painted walls and there were more worldly goods. Van den Ende senior, a pre-war UCT medical graduate and charismatic immunology lecturer, was described by one of his former students, former vice-chancellor Dr Stuart Saunders, as 'the brightest star in the constellation of UCT medical graduates'. The eponymous lecture was held on the 50th anniversary of his death and was attended by his widow, daughter and grand-niece.